Back when I was heavily into electronic music, I had a fondness for a lot of the stuff that came out of the Scandinavian countries. Maybe it’s the climate, but much of the music had a cold and minimal but still oddly soulful sound that I really enjoyed. And in many cases, the cover artwork would also have a very sparse and minimal design that would fit the music well. I mention this because the labels on the beers from Norway’s Nøgne Ø Brewery remind me a lot of those CD covers. 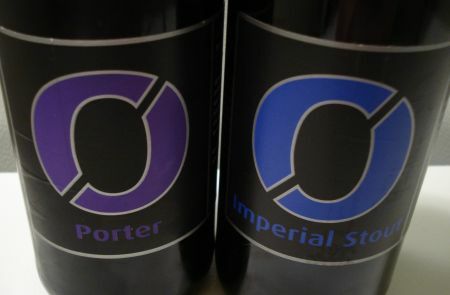 Every beer in their line-up features the same basic label design – a large stylised ‘Ø’ logo with the beer name underneath – with only the colours changing from brand to brand. Very clean and minimal, and also very eye-catching. I’ve only been able to try a small handful of their beers since they first started making their way across the ocean a couple of years ago, but I’ve enjoyed them all. Recently, local beer importers Roland + Russell added Nøgne Ø to their portfolio, and they dropped off bottles of their Porter and Imperial Stout for me to sample. I’d had both beers before, but certainly had no complaints about drinking them again. Deep ruby-brown with a moderate tan head. Big, roasty aroma with notes of coffee, bitter cocoa, burnt sugar and oak. Slightly thin mouthfeel, but appropriate for the style. Fantastic flavour of dark chocolate, malted milk and slightly over-roasted coffee, with a lactic twinge and some alcohol warmth in the moderately dry finish. A bit strong perhaps, but pretty fine otherwise. Deep black with a small dark tan head. Aroma is big and roasty with notes of dark sugar, chocolate, and hops. Full bodied. Flavour – wow, that’s good! Very full and lush, with notes of coffee, chocolate, dark malt, licorice, and a lot of hops. Excellent! This entry was posted in beer reviews and tagged porter, stout. Bookmark the permalink.